Situated in 9 Gulab Singh Marg of Jammu, Fortune Inn Riviera is a good value for money. It is a 3 star hotel that offers the guests an extremely friendly accommodation. The hotel is well known for its warm way of hospitality and the staff that happily serves the guest round the clock. The hotel is located at an easy reach from the center of the city, the airport and all the major tourist charms of the region. The hotel is a perfect option for stay during a lavishing vacation in the region that spellbinds all the tourists. Accommodation The hotel includes 29 well appointed rooms that are further divided into three levels. Every room is well designed, spacious and centrally air conditioned. The hotel offer modern amenities such as LCD TV, WI-FI, tea and coffee maker, minibar, hair, dryer, iron on request, Direct dial phone services, electronic safe. Every room is equipped with an attached bathroom and running water (both hot and cold). The hotel also offers banquets and conferences. Sapphire is a spacious banquet hall that has a capacity of accommodating around 400 people. Sapphire- 2 and Sapphire- 3 are the two conference rooms that can accommodate approximately 50 people. Dining The hotel has three dining options to treat the taste buds of the guests with its scrumptious delicacies. The Orchid provides an assortment of culinary delights and palatable buffets that make this restaurant a perfect place for a relaxed dining. Earthen Oven is an alluring North Indian Restaurant. It presents an irresistible list of kebabs with breads coming out straightly from the tandoor. Neptune is a modern and comfortable setting that offers the perfect selection of wines, spirits and beers. It also serves cold beverages and snacks. There is played a lively music in the restaurant that doubles the dining pleasure of the patrons. Tour My India is a perfect place to avail the best deals on Hotels In Jammu. 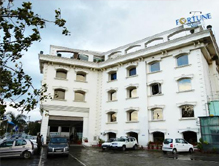 The fascinating list of hotels in Jammu, in which we offer the attractive deals for accommodation, also incorporates the Hotel Fortune Inn Riviera. 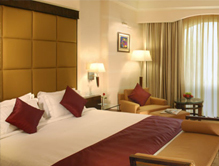 Avail the best accommodation packages, from Tour My India, and allow us to provide you with a relaxing stay experience.